Book now or enquire - click here! We run this retreat because we want to share with you the joy that Pilates, yoga and self-awareness can bring to your life. ​We really hope that you can join us! Set on a former Duchy of Cornwall farm, in a beautiful rural setting on the Cornwall/Devon border, this retreat will be five days of Pilates and yoga, with sessions of meditation, mindfulness and much more! Take this chance to immerse yourself - recharge, relax and reconnect, surrounded by nature. All activities are optional and you can choose to take part or opt out as you wish. These five days will be an opportunity to discover how yoga and Pilates can unlock your physical potential, while you make a journey of self-exploration using art, meditation and relaxation techniques to release your inner awareness. Karine and Charles will guide you on your holistic journey to a land of health and well-being, with a splash of English humour and French style! Arriving on Tuesday afternoon, you will receive a warm welcome and a Cornish cream tea before settling into your accommodation. We will have a gentle meditation & restorative yoga session to relax you after your travel. In the evening we will enjoy dinner together. Please note that whilst we will do everything possible to adhere to the programme, some things are outside our control, and we therefore reserve the right to make changes if necessary. Lower Marsh Farm is on the outskirts of the pretty village of Landulph in the Tamar Valley on the Devon / Cornwall border. It was a finalist in the Cornwall Tourism Awards Self Catering Property of the Year 2017 category and awarded Highly Commended in their Wildlife Friendly Tourism Business Award category. This gorgeous spot has its own private woodland, orchard, vegetable gardens, shingle beach, and the salt marsh has been designated as a Site of Special Scientific Interest. The tranquility of this area will allow you to completely immerse yourself in nature and find your own private place to meditate, reflect and reconnect… or simply taking some quiet time alone with the elements and nature. There will be ample free time to relax, practice your serve on the tennis court or switch off in the hot tub. There are quiet spots to sit and contemplate and a hammock to snooze in! Or treat yourself to a peaceful walk in a world of greenery, while looking out for deer and squirrels in an Area of Outstanding Natural Beauty, set in over 40 acres of grounds sloping down to the River Tamar. ​You can also opt for a Reiki session or an aromatherapy massage (at an additional cost of £65 per session). Nearby attractions include the wonderful National Trust house Cotehele, which is well worth a visit. Or, further afield, you could visit Lydford Gorge or the Eden Project. 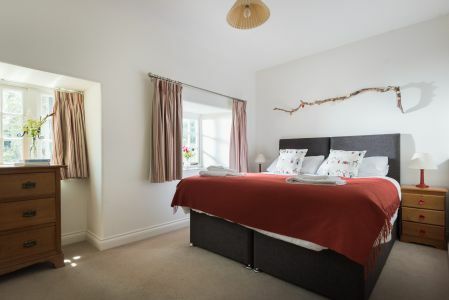 You can drive to the farm (there is ample parking), take the train to Plymouth (frequent trains from London Paddington) or fly to Exeter Airport. Taxis are available to take you to the farm (30 mins journey from Plymouth station). For details of how to get to Lower Marsh Farm, click here. Arriving on Tuesday afternoon, you will receive a warm welcome and tea before settling into your accommodation. We will have a gentle meditation & restorative yoga session to relax after your travel. In the evening we will enjoy dinner together before a welcome ceremony. Please note that whilst we will do everything possible to adhere to the programme and details laid out below, some things are outside our control, and we therefore reserve the right to make changes if necessary. FREE AFTERNOON - sit in a meadow, play tennis, relax in a hot tub, read a book, snooze in a hammock, go for a walk, visit a National Trust house...you choose! The price of the retreat includes breakfast, lunch and dinner. All meals will be vegetarian, prepared by our in-house chef, using fresh local ingredients whenever possible. Bread is from a local bakery, made using the traditional sourdough method. Milk and cream are from the local dairy. Apple juice is from the farm! If you have any special dietary requirements, please let us know and we will try to accommodate them. Vegan is no problem - just let us know. There will be a Cornish cream tea and dinner on arrival day and brunch on departure day. You can help yourself to hot, cold and soft drinks throughout the day, and afternoon tea will be available. 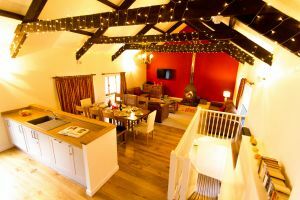 ​We have accommodation available in Kingfisher Barn and Orchard Cottage. Prices are per person and include 5 nights accommodation, all meals and classes. 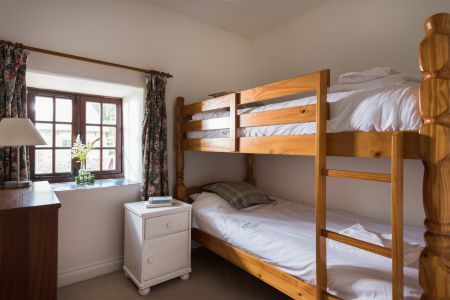 Accommodating 2 or 3 people with a king size bed or two single beds and a double sofa bed. 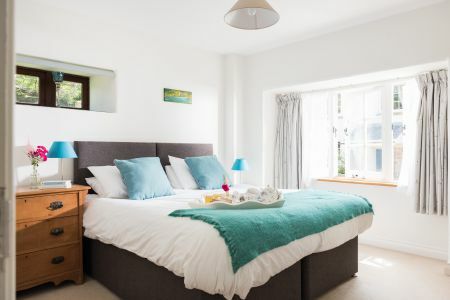 Set on the ground floor, with a garden which overlooks the orchard across the woods, the cottage was been fully refurbished in 2016 with a modern kitchen, oak flooring and a wood burning stove. There is a luxurious private en-suite bathroom. Outside there’s a private garden area overlooking the orchard with your own private hot tub, table and chairs. Karine is a qualified yoga teacher, Reiki Master, aromatherapist and crystal healer. Trained at Triyoga, one of Europe's most prestigious yoga centres, she divides her time between London and Paris, combined with teaching workshops around the world. Her yoga style is Scaravelli inspired, rooted in the Hatha Yoga tradition and, like all her work, is focused on supporting people in awakening to the mystery of who they truly are. Charles is one of London's leading Pilates teachers. His classes are fun but rigorous, suitable for all levels. Comprehensively trained and accredited by the Pilates Foundation UK, Charles is fully qualified to teach all forms of Pilates. His training in anatomy supports a keen interest in postural problems. Using carefully-selected Pilates exercises, he helps his clients to improve their posture, reduce back pain, recover from injury or surgery and to deal with many musculo-skeletal issues. Above all, Charles believes that Pilates should be enjoyable and tries to ensure that his clients find it a positive, enlightening experience and are left with a sense of satisfaction and well-being. Scaravelli-inspired yoga is both gentle and demanding. It is a form of Hatha yoga which focuses on developing core strength through the release of tension. Using the breath and integrating the use of gravity, it works on lengthening the spine to create space in the body. The result is freedom of movement, a release of mind and body and a boost to the energy. Scaravelli-inspired yoga is a stress-free yoga that can benefit everyone. Karine welcomes working with anyone - no matter how stiff, weak, flexible or strong. Her classes are suitable for all ages and all levels of yoga experience. They cultivate awareness, flow of breath, clear energy and strong alignment to balance and open the body. Pilates is a method of exercise that strengthens and tones the body without building bulky muscles. It promotes alignment and elongation, avoiding boring repetitions by focusing on precision and concentration. Pilates can help with recovery from injury or surgery, improve posture, reduce back pain and deal with many musculo-skeletal issues. It is an ideal way for anyone to keep fit, supple, strong and prevent injury. ...why not connect on social media? Just click the icons below. By following Charles, you'll receive updates, latest news and thoughts on Pilates and related subjects (plus some on life in general! ), direct to you.